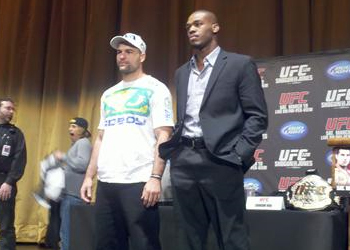 “UFC 128: Shogun vs. Jones” will be jumping off this Saturday from inside the Prudential Center in Newark, New Jersey. To help tide fanboys over until Jon Jones challenges Mauricio “Shogun” Rua for his light heavyweight crown, the world’s premier mixed martial arts promotion has released the video preview for Saturday night’s main event. Will Shogun make his first successful title defense by fending off the fast-rising youngster, or will UFC 128 mark Jones’ official coming out party? According to the Gambling Gods, it will be the latter. “Bones” is a significant 2-to-1 favorite to dethrone Shogun. Saturday’s pay-per-view broadcast begins at 10PM ET/7PM PT.